Stanley Park is one of the most popular parks in the world and is one of Vancouver’s top attractions. Tourists for all over the world visit just to take a walk through Stanley Park and see its gardens, lush greenery, and totem poles. It encompasses 1,000 acres and it lies very close to downtown. It is full with wildlife, plants, trees and natural beauty. You can ride, walk, bus or rollerblade to and through the park. Dine at the Rose Garden Tea Room, the Sequoia Grill or at the Fish House and enjoy some fresh seafood dishes. You will find many landmarks within Stanley Park such as the Siwash Rock, Nine O’Clock Gun, sculptures, Prospect Point, the Lost Lagoon, and Beaver Lake. Take a walk along the seawall that goes from one end of the park to the next, or enjoy a picnic on some of the parks soft grass. There is something for everyone of every age group to do in Stanley Park. Granville Island is a peninsula and shopping district in Vancouver, British Columbia, Canada. It is located in False Creek directly across from Downtown Vancouver’s peninsula, under the south end of the Granville Street Bridge. The peninsula was once an industrial manufacturing area, but today it is now a major tourist destination and working neighbourhood. In 2004, Project for Public Spaces named Granville Island “One of the World’s Great Places”. Whistler is a Canadian resort town in the southern Pacific Ranges of the Coast Mountains in the province of British Columbia, Canada, approximately 125 kilometres (78 mi) north of Vancouver. 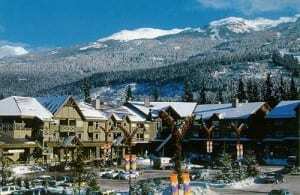 Incorporated as the Resort Municipality of Whistler (RMOW), it has a permanent population of approximately 9,965, plus a larger but rotating “transient” population of workers, typically younger people from beyond BC, notably from Australia and Europe. Over two million people visit Whistler annually, primarily for alpine skiing and snowboarding and, in summer, mountain biking at Whistler-Blackcomb. Its pedestrian village has won numerous design awards and Whistler has been voted among the top destinations in North America by major ski magazines since the mid-1990s. During the 2010 Winter Olympics, Whistler hosted most of the alpine, Nordic, luge, skeleton, and bobsled events, though freestyle skiing and all snowboarding events were hosted at Cypress Mountain near Vancouver. Victoria is the capital city of British Columbia, Canada and is located on the southern tip of Vancouver Island off Canada’s Pacific coast. 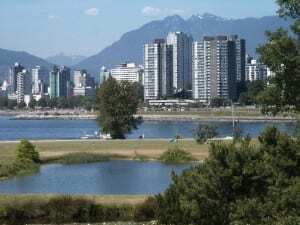 The city has a population of about 78,000 within the metropolitan area of Greater Victoria, which has a population of 360,063, the 15th most populous Canadian metro region. 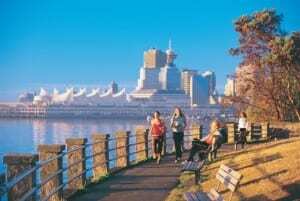 Victoria is about 100 kilometres (62 miles) from BC’s largest city of Vancouver on the mainland. 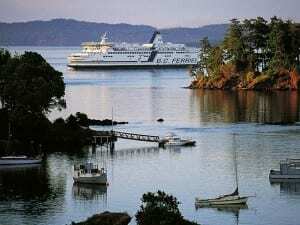 The city is about 100 kilometres (62 miles) from Seattle by airplane, ferry, or the Victoria Clipper passenger-only ferry which operates daily, year round between Seattle and Victoria and 40 kilometres (25 miles) from Port Angeles, Washington by ferry across the Juan de Fuca Strait. Grouse Mountain is one of the North Shore Mountains of the Pacific Ranges in North Vancouver, British Columbia, Canada. Exceeding 1,200 m (4,000 feet) in altitude at its peak, is the site of an alpine ski area in the winter season overlooking Greater Vancouver with four chairlifts facilitating 26 runs. In the summer, the mountain features lumberjack shows and a 2.9 km (1.8 mi.) hiking trail known as the Grouse Grind. Year-round operations include a 100-seat mountaintop theatre and a wildlife refuge. 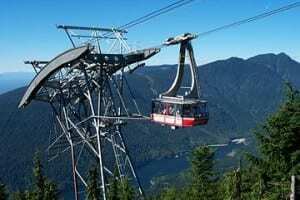 Public access to the mountain top is by a Swiss Garaventa aerial tramway, or the Grouse Grind hiking trail. 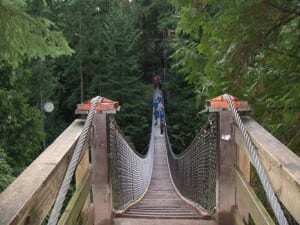 The Lynn Canyon Suspension bridge is one of Lynn Valley’s best kept secrets. The 50 meter high bridge stretches accross a beautiful canyon boasting raging waters, waterfalls and deep pools below. The bridge is a popular attraction among tourists and locals alike, the best part is that it is free of charge for all to see. Crossing the bridge is always an exciting experience, it bounces up and down and sways from side to side with every step. Lynn Canyon Park is the home of several beautiful hiking trails that are suitable for any hiking level. If you are looking for a leisurely stroll through the forest or a brisk climb up hill, Lynn Canyon has lots to choose from. Grab a coffee and a treat from one of the nearby coffee shops, and head over Park and Tilford Gardens, a European-style garden with eight themed areas on 2.8 acres of land. 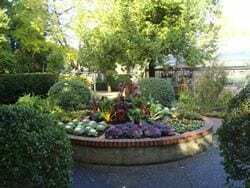 Bridges, hanging baskets and a Japanese garden make this one of North Vancouver’s most tranquil corners. There’s something to see year-round at this beautiful garden. If you are visiting in December, the Christmas light display is a must-see. 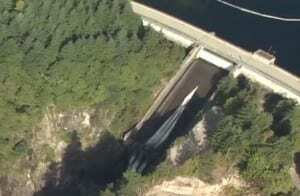 Capilano River Regional Park is most commonly associated with the Cleveland Dam. Admission to the dam is free, and one can walk across the dam and observe the river and the spillway. There is also a fish hatchery in the park, about 500 meters downhill from the Cleveland Dam. The hatchery offers educational displays explaining the type of work that is done there, as well as basic education about the life cycles of the fish in the area. The rugged waters of the Capilano River within the park also attracts kayakers and canoers. There are also a number of nature and biking trails in the park, and it is frequently used as a location for film and television production.